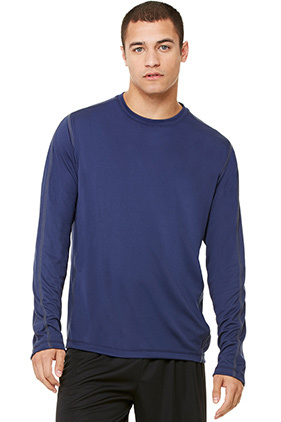 A lightweight and breathable performance long sleeve. 100% polyester knit interlock with poly mesh under arms. Contrast cover stitching at arm and side panels. Performance fabric features dry wicking capabilities which draw moisture away, keeping you cool and comfortable. Added antimicrobial treatment prevents the increase of bacteria and keeps clothes odor free. Tear away label.